Today we land in the Falkland Islands. There are 4 groups going out. The first group is doing a 5 miles round trip hike to an elephant seal colony. The second group is the birder group heading in the opposite way. The third group is going 2 miles round trip on another trail and the 4th group is going to wander on their own. I decided to do the 2 mile walk because I wasn't sure if the ground would be wet and hiking 5 miles in these heavy boots might be difficult. I woke up at 6 as I had planned and went for breakfast by 6:45. I called Jane’s room about every 15 minutes, but no answer. I figure she turned her phone off and stayed up all night. I decided not to worry, as we all know that sleeping late is not unusual behavior for Jane. The temperature out is a balmy 50 degrees and the winds are calm. I have my light fleece pants tucked into my boot, and my waterproof pants over the boots. I'm wearing just a light turtleneck and fleece under my jacket. I have on my hat, but no gloves (although I brought gloves along in my backpack. This was perfectly comfortable for this outing. By the time I returned to the ship, the winds had picked up considerably, but no one was really cold. We had to step into disinfectant when we left the ship and when we returned to the ship. We landed on the beach where two elephant seals were engaged in a short lived argument. We hiked a very short distance and saw a colony of penguins. Some were molting. A few waddled down to the beach for a swim. The terrain was soft and sandy with small flattened rocks strewn about. We also saw quite a few large vertebrae lying in the sand. The birds and penguins were obviously used to strange beings dressed in red parkas milling about and paid us no mind. We were told not to get between the seals and the water. Except for the penguins, almost all of the other living creatures were the same color as the kelp, so you had to watch your step so as not to step into a nest of baby ducks or come too close to the seals. 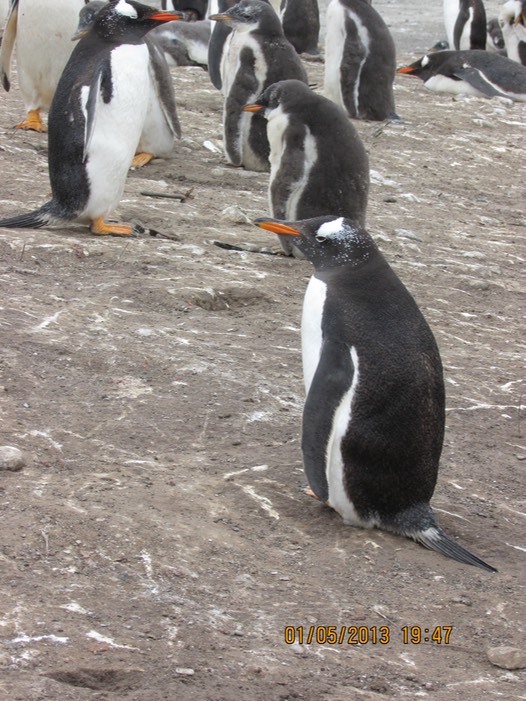 There are two types of penguins where we landed, Gentoo and Magellanic. 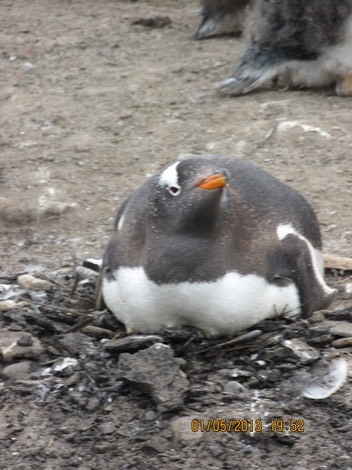 Gentoo Penguins have bright orange beaks and white patches over their eyes. Some penguins, like Gentoos, nest on rocks, some nest on the ice and some in little carved out spaces in the ground. Surprisingly my muck boots were quite comfortable to walk in. I spent 2 hours on this first excursion. (The zodiacs were going back and forth to return anyone who was ready back to the ship, so you didn't have to stay longer than you wanted.) Hot vegetable broth, hot chocolate, coffee and tea were waiting for us when we returned. Another outing this afternoon. When I returned for lunch, I found out that Jane had gone out with a much earlier zodiac and she ended up doing the 5 mile walk to the sea lions by herself. I was delighted that the had gotten up and I was very proud of her. For the afternoon outing, though, there was an option to take a Land Rover to the penguins, a treat Jane definitely earned! At 2:30 we left the ship for Bleaker Island. It was 61 degrees and there was a chance of rain showers. I removed my fleece and put it into my backpack. The walk to the penguins was about 1.5 miles. We saw Rockhopper penguins an one Macaroni penguin. I asked. "Why a lone Macaroni?" I was told that it was common for immature males of any breed (and even other species) to wander off and "hang out." When they breed, they return to their own kind. (My parents would have liked that, too. Oh well.) In a later lecture, we were told that Macaronis will actually mate with other species of penguins, but no other penguins will cross breed. Apparently they like hanging out with an unfamiliar crowd. We saw lots of cow pies but we didn't see any cows, although we later learned they are around. 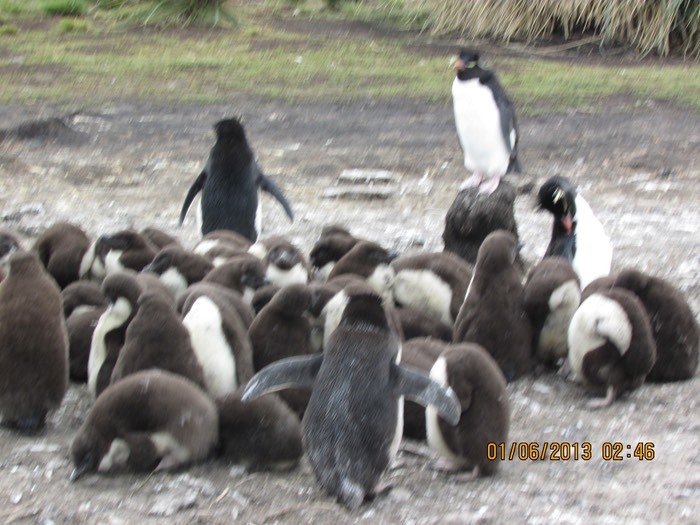 The penguin chicks were all huddled together and adults were stationed around to stand guard and watch for predators. There were other adults whose job it was to corral any wayward chicks. I have movies of penguins doing both jobs but don't know if they will load. See the adult rockhoppers stationed on the periphery with their wings out guarding the chicks. I have a movie of them looking right - left -right continuously watching. They do not leave their posts. 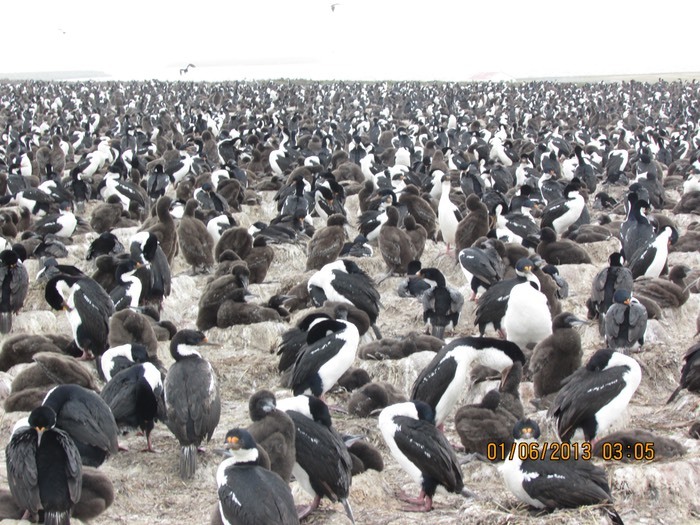 We also saw the largest King Cormorant colony in the world. Over 9000 pairs in addition to their babies. 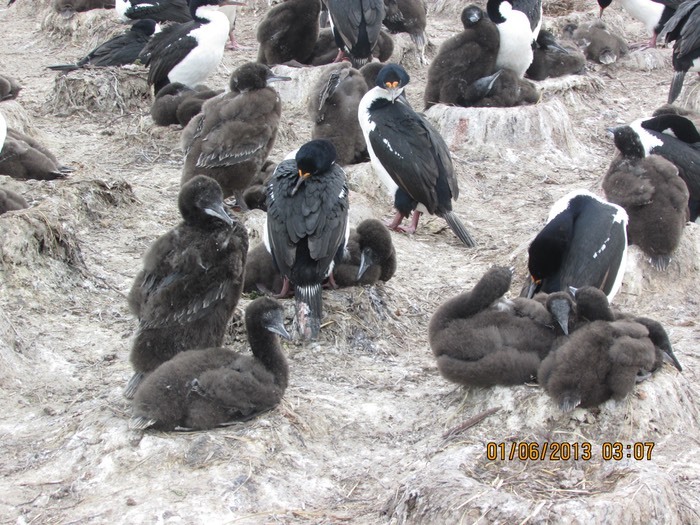 Each family of baby cormorants were on an individual mound with a parent attending. These mounds are the remains of tussac grass pedestals. 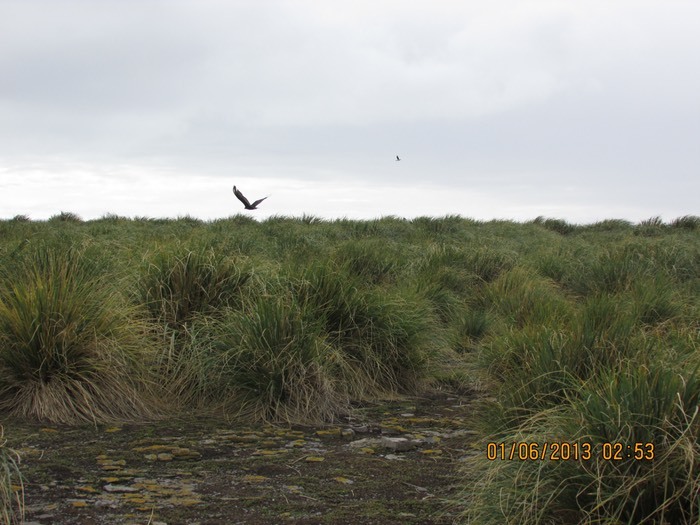 Tussac grass covers many areas of the Bleaker Island and is crucial habitat for many species of birds, insects, etc. There are fences to keep the sheep and cattle out of the tussac grass because they destroy it. Tussac mounds with grass are necessary for survival of many species. Bird of prey are always ready for a meal. King Cormorants as far as the eye can see. Each family is on one tussac mound. See the babiy groups on individual mounds with one parent in attendance? The walk back was treacherous. The winds were howling at 50 mph (although it was still warm). It was very difficult to walk and I got a good workout. On the zodiac, we had to go out of our way in order to get around the wind and not get soaked. The zodiac driver did an excellent job. We were lucky that it didn't rain. The captain just announced that we should all put our stuff away and secure our cabins for a bumpy ride. Don't doubt it with these rough winds. At 7 pm we had our first recap assembly. There's a bar stationed outside the theater to "encourage" attendance. Naturalists review and elucidate what we have seen that day. Very informative, and a chance to ask questions. The ride during dinner was surprisingly smooth. We ate in the big dining room (where you are served, as opposed to the buffet.) I had carp with no bones. This was definitely not the carp my mother made. The fish was delicate , boneless, and tasted more like black cod. It was perfectly prepared. We have met so many interesting and wonderful people. Jane and I realized we didn't have any pictures of us together (or apart, for that matter.) We'll have to change that. Tomorrow we will be at sea. I woke up today (Monday) feeling under the weather. I haven’t been sleeping more than a few hours a night and it caught up with me. I found out the problem yesterday - I had been taking Vitamin D instead of my trazodone. Silly me. They look similar. I finally slept last night, but was awoken by an announcement by the captain. I called Jane when I got to the buffet for lunch and she was just getting out of bed herself. We had lunch at a table with 3 English women. They didn’t seem to hate me - yet... so I was encouraged. 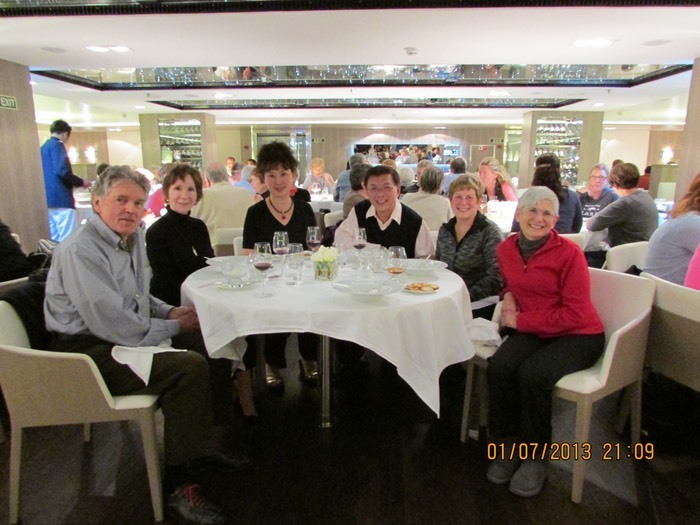 Tonight we had dinner in the main dining room. It was crazy noisy - hard to have conversations.